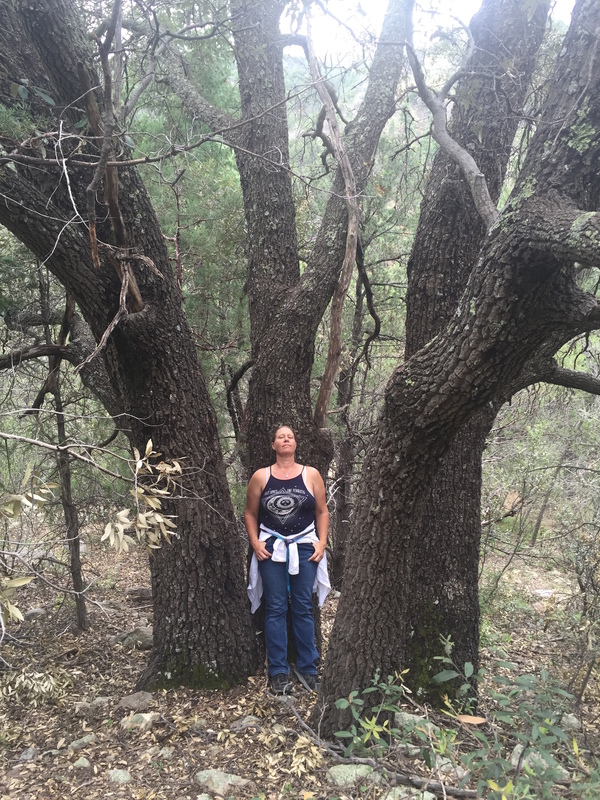 In our continued effort to put together this September Oak Tour in New Mexico, Anna Forester and I did a whirlwind visit to a few of the sites we intend to show you. Our objective was to get the timing down and also to check the condition of the trees and the seed production. In addition we needed to address expenses that need to be covered as soon as possible for those hotels or lodges that are in big demand this time of year. How are we going to pay for the lodging and vans? Please see the end of this post for details of costs. Night of September 23 and the last day, September 29. The Start and the Finish. Arrive in Los Lunas and get lodging at one of the following. Quality Inn, Day's Inn or the Western Skies Inn. Once you have reserved your space with a down payment, Laura can begin arranging your rooms at the various lodgings. Here's a breakdown of where we will be staying. Day 1: Night of September 24, the Black Range Lodge see http://www.blackrangelodge.com a beautiful historic building from the gold mining days of the 1800s. Catherine, owner of the Black Range, will provide us a home cooked dinner and breakfast plus a nice bed. Day 2: Cloudcroft Lodge see http://www.thelodgeresort.com a beautiful 1800s lodge at 9,000 feet elevation. Day 1: On our way into the Black Range Gila National Forest we will drive into Animas Creek Canyon where the Nations largest native sycamores (Platanus wrightii) grow. From here we continue to the mountain town of Kingston where we will spend the night in the historic Kingston Black Range lodge. From this location we will hike up Percha Creek Canyon to several large Quercus hypoleucoides (exhibit A) and single-trunk specimens of Quercus gambelii (exhibit B); going up the canyon about 2 miles is the largest silverleaf oak, if we can make it this far. The hike follows a Forest Service road and does not have a steep grade. Elevation change in the hike is 6,200 feet to 7,000 feet. Along this hike can be seen very large New Mexico alder (Alnus oblongifolia, see exhibit C) and gray oak (Q. grisea). For those not wanting to make the hike, the Black Range Lodge and surrounding Ghost Town are very interesting to explore. Acorns on trees right now in Percha Creek Canyon include Q. gambelii and Q. grisea. Since most New Mexico and Southwestern oak species mature and drop their acorns in August or earlier, I'm collecting Q. grisea seed to have available to anyone that wants some. We've already missed Q. emory and Q. hypoleucoides. Day 2: Drive to Las Cruces and the Organ Mountains, where Dripping Springs is on the west side and Aguirre Springs on the east side. Dripping Springs requires a 3-mile round trip hike with an elevation gain from 5,600 feet to 6,300 feet. Seen on this site is a Mexican Madrean Oak Woodland including a unique oak of unknown genetics called the Organ Mountain white oak, which is similar to Q. polymorpha of Mexico. On the east side at Aguirre Springs we will pass through a population of turbinella oak (Q. turbinella) and see a pure stand of Arizona white oak (Q. arizonica, exhibit D). After Aguirre Springs we will visit White Sands National Monument where you can play in pure white gypsum sand dunes (exhibit E), before ascending 5,000 feet to the top of the Sacramento Mountains to the historic lumber town of Cloudcroft where we hope to spend the night at the Cloudcroft Lodge. Dinner most likely we be in the town of Alamogordo at the bottom of the mountain before we ascend into the clouds. Dinner will be on your own and not included in the group fee. Day 3: Drive from Cloudcroft to Carlsbad Caverns National Monument. You can hike to the bottom or ride an elevator down 700 feet into the Big Room. The Big Room can hold the entire U.S. Capitol Building. Return to Carlsbad for the night. Entrance fee into the cavern per person is $10, kids under 15 are free. We will return to the town of Carlsbad for the night and stay at the Best Western Stevens Inn, where we will also have dinner. Dinner is on your own, not included in the group fee. After hiking McKittrick Canyon we will drive to Roswell, New Mexico for the night. Day 5: Drive from Roswell up to the mountain village of Ruidoso and stay in the Hotel Ruidoso, a very nice facility. Before getting to Ruidoso we will stop at the Wild West town of Billy the Kid, Lincoln, New Mexico. Lots to see and fun history to explore in Lincoln. After Lincoln and a short drive to Ruidoso we hope to have time for shopping and wondering the main street where there are lots of shops and restaurants. Dinner is on your own. Day 6: Depart Ruidoso and drive to the Valley of Fires lava flow. The flow is less than 3,000 years old and the second youngest in the United States. After a short visit and nature walk we will drive to Gran Quivira, a native American pueblo and a Coloniel Spanish Mission that dates back 700 years. The Mission, with massive stone walls, still stands, along with the many kivas and walls of the pueblo. See http://www.panoramio.com/photo/65664486. From here we will drive into the Manzano Mountains to see Fourth of July Canyon, where the Nation's largest population of Acer grandidentatum covers thousands of acres. Also found in the canyon are Q. gambelii and Q. macrocarpa, with mixed genetics, providing fodder for plenty of debate. From the canyon we shall drive 90 miles back to Los Lunas where we hope to have a group dinner depending on how late and how tired we are. Lodging will be at one of the Los Lunas motels where the vans can drop you off.